Following FAQ are typical articles and designed for quick review if needed for operators of ex-Opton bender or design engineers to help self-finding of any solution to their queries. Where and when can Opton products be available for demonstration? Four in-house exhibitions are held in addition to average three national trade shows every year. For these schedules, please visit Opton news in the Opton home page. Demonstrations are also available throughout the year at Opton factory. For your visiting schedule, please contact for inquiry. Wear and gall of tooling are serious problem in bending of stainless pipes. Are there any good way suggested to keep quality of molding dies and wipers? ① Galling shall occur when a stainless work piece and metal tooling rub against each other, To avoid this wiper die is generally made from non-ferrous alloy represented by aluminum bronze or beryllium copper. ②Wiper die can stay free from galling by using rather soft metal like non-ferrous alloy, but with adversary disadvantages of sharp wear of the die. Opton original 『Wiper-integrated bending roll』 is proposed for solution. This unique wiper-integrated mold has be realized by fundamental and innovative review of mold design and has achieved the service life of many ten's times longer against ordinary set of mold and wiper. ※ For detailed information, please visit 「Bending tools」 . ①Molds with TiC-N coated are supplied as standard specification for working with stainless work piece. ※In preparing molds, the best-suited quality of material and coating will be employed to meet individual machining conditions. ②Proper selection of lubricant media must be considered to meet machining conditions that varies among the specifications of production parts. Q Power-shortage error is found with the encoder battery in the first working day after holiday. A. This error is caused by power shortage of the robot' battery. Battery replacement is needed. Q. What is the case where "teaching" must be involved in machining by the machines in the Robot Bender Series. A. "Teaching" is not basically involved in relation to the creation process of the bending data. The "teaching mode" is employed for two robot functions, or "loading of a work piece to the chuck" and "unloading of a completed part into specified position". Q. Is it ａ must for machine operator to join training course of handling the robot? A. The 「Ordinance on Industrial Safety and Health 」　regulates that the training on the teaching work and maintenance of robots must be held by qualified person who has completed the course of 「Special Training of handling the robot」. Under this regulation, the training course will be held by the Opton's qualified specialty at a client premises. Operators can also attend to a robot operation school held by the robot manufacture.In either course provided are handling manners of the robot and robotic system, daily cares as well as total maintenance with the contents organized to meet the request by user's operators. Q. Is the cable consumable material that is supplied in a package of the machine? A. Basically yes. The cable is replaced by a new one in a periodical maintenance check by Opton engineer. The cable supplied in a package of the machine is intended to be for quick maintenance by machine user himself. Q. T-WIN 25 in Opton HP shows the figure 1000mm/sec as the standard velocity of DBB. Can this speed be modified to higher speed? A. Yes, higher speed is possible.Listed speed is just the "standard" figure, which can be modified to meet user's tact-time requirements. What are the max allowable length of work piece that can be accepted by Opton profiling machines ? There is basically no limit of work piece size for profiling by the Croudforma Ⅲ. A work piece is placed for testing on the surface plate with position marking. The surface plate with position making is sized 700 x 1000 mm as standard, and these sizes eventually indicate the size limit of a testing work piece. For longer-sized work piece, the surface plate is also available for 1800 x 1000 mm. Other sizes can also be custom-made. For work piece larger than the space of the surface plate, divided profiling may be applied. Is there any way good for improving tool setting time and set-up repeatability? Opton's ｆully electric-powerd Pipe Benders have all motion axes servo-driven and numerically controlled. Simply by modifying the setting values of the molds through the operation window, minutest setting adjustment can be achieved easily. Once the molds are set, the setting data are saved for individual part number and the data can be up-loaded to exhibit on the display for identical set-up of the mold whenever the same part is going to be machined again. With Opton's fully electric-powered pipe benders, cutting of set-up time and enhanced set-up repeatability can be achieved. Thanks to chainless and single-linked two-motor structure, the compacted bending head and eventual envelope spade, collision of work piece to the mechanism is minimized. Fully dust-proved controller box (Totally closed air-conditioning is implemented.) Controller system is protected in safe more than before from errors attributed to severe ambient condition as well as under normal services. What are the advantages of Opton's 「CNC Pipemulti bender」? Simply by inputting machining data to the computer bending can be achieved for restriction-free designated bending R and bending design yet with no tooling change needed as long as material diameter remaining the same.. No clamping space needed on the tool for easier execution of continuous R bending. Quick proto-type work can be easily met. Continuous-R bending can be met and no chucking space needed on a work piece. Since bending with low flattening and small thickness reduction can be met, parts with high-profiled design can be best suited to this machine model. Explain the difference in bending data creation for the robotic bender between those for "center-work chucking mode" and "end-work chucking mode ." One full data package includes all bending data for both sides of a full work piece, or the data for left-bending and right-bending. There is no need to down load the data of two areas separately. For end-work chucking mode, the bending data are to be prepared in the same manner as those for standard bender with chuck installed for holding a work piece at its end. Explain about the advantages in addition to wiper cost reduction by employment of the new roll wiper. The advantages are long-lasting quality production, operation by a skill-less operator, and enhanced running rate of the machine, all leading to production with higher profitability. What are the advantageous features of Opton Roll Bender ? Following advices are made on Opton's ｢3 Roll Bender｣. ・Opton presents the models as「CNC Rolling Bender」 series. ・The features are: three-rolls correlative positioning where the top roll maintaining stationary positioning and two bottom rolls positioning by NC allowing adjusting the center distance between the top roll and the bottom rolls as one and between two bottom rolls as the other, thus leading to bending performance to minimize the straight section of material at times of first and last bending.Another feature is the bending R being applied at gradation. ・Stable repetitive production can be made by CNC controlled roll motion speed and execution of bending data. Any advice available for easier tooling set-ups and for enhanced repeatability ? What is the advantage with horizontal travelling of the clamp die for ECO series pipe benders. When a clamp die moves upwards in a conventional toggle motion and clamp a work piece, a pushing force is normally given to the work piece causing its subtle but unneeded rotation. Horizontally sliding motion of the die has freed this problem. Longer stroke distance has become available than the toggle mechanism, leading to easier bending at higher profiled specification. ※The machine with toggle mechanism still available. What are the trial chances of bending available at Opton's premises? Opton holds in-house exhibition every quarter period of the year with many models ready for various demonstrations. Followings are typical models to be exhibitedconstantly. AC servo motors are installed for all axial motions. Speed- and accuracy-oriented performance are embedded together with N/C supported easier setting-up works. The Dual Robot Bender is an ideal machine for speed-oriented bending of long-sized work pieces (5～6m long). A work piece is clamped firm on its center position and the robots perform all motions of DBB, POB and DOB , leading stable bending because of minimized material swinging during processes. What are the Opton's Core Technologies? Opton's unique core technologies comprised of 「Sensor」「Intelligence」「Power」「Hardware」 valued R&D tools to keep markets being satisfied. Opton is capable to provide feasible engineering proposals of automation and systematic production facilities to the markets based on these long experienced technologies. What is an Opton's experience on the heat-exchange pipe bending for "ECO-CUTE" or related products? Opton has ever supplied to the market fully-automated production systems with CNC pipe benders included. The supplied systems include many for bending not only standard works of round diameters, but materials of irregular cross sectioned with squared designed inclusive. Are dual bending modes available with the ECO CNC Pipe Bender, or normal bending mode as one and multi (-R) bending　mode as the other? Yes. thanks to AC-Servo-motor-driven DBB traveling build-in the new ECO Bender , two bending modes of normal and multi(-R) bending mode are switchable by simple setting change for the corresponding tools. What are the features of Opton CNC Benders? Two Opton Bender Series available, or 【ECO Bender Series】 and 【WIN Robotic Bender Sereis】. One of the most outstanding feature with 【ECO Bender Series】 is its module-oriented design of the machine that helps Opton to meet easier to user's varieties of requirements by tailor-made quality of Opton engineering. The varieties of user requirements may include the concerns, for example, on investment cost, machine performance or installation space, etc. Against Opton's long but old manners of machine proposal with rather restricted choices available of specifications, the current and new proposal with 【ECO Bender Series】allows Opton to meet market demands more wide and flexible than ever. 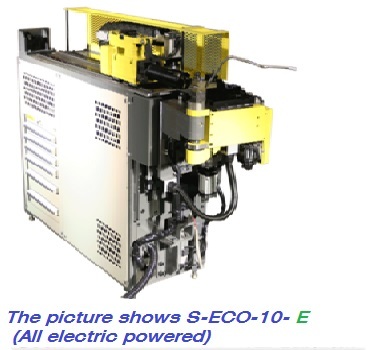 【ECO Bender Series】 allows users to include in the machine the function needed for the job with the custom-made qualities. Try this by referring the table of the series, please. The remarkable feature of the products in the 【WIN Robotic Bender Series】 cn be claimed as the performer with ultimate enhanced production rate. This enhanced production rate is achieved not only in the term of tact-time cut, but in the sense as well of high possibility of use's free idea being realized in his best production systems. Opton has many successful cases of this nature to be of reference to clients. CNC Multibender can meet bending of materials including pipes and non-pipe materials with regular and irregular cross-section designs. CNC Pipe Multi is exclusively for bending pipes that has intrinsically symmetrical cross section design where twisting of work piece is unlikely during bending process. For bending materials of irregular cross section design like those for vehicle door sash and mold, twisting of material is unavoidable due its eccentric or asymmetric design of cross sections. Opton Multibender has an extra axis to control over this twisting amidst bending. Availability of prototype work and mass production work of pipe bending at Opton's premises? Opton is the manufacturing seller of pipe bending machines and 3D profiler machines. And we can offer the trial bending for clients to evaluate the machine on enquiry, but does not respond with any further service including mass-production or test-run etc. What are the features of Opton Robotic Benders? They are labor- and space-saving, flexible production with varieties of materials and production volumes including one piece-per-lot production, enhanced quality of post-bend parts, etc that are all remarkably superseding those of the machines currently at services in the markets. The Robot Bender itself performs works of bending during at loading and unloading stages. Work pieces with parts and fittings prefixed can also be put in the production line. Thanks to no rotation of work piece for POB process, a long-sized work piece can be processed with minimized swinging thus leading to higher-speed bending yet for enhanced quality of work. Based on many successful cases established of all of the above in the markets, we are pleased to prepare the best proposal upon an inquiry being given to us. Is there a bending machine for one-point bending? Yes, Opton can offer the AB/UB Bender where the bending head of standard bender is mounted on the simplified frame. Various capacities are available from small to large. The machine with DBB powered by booster is also available for 1D bending. If manual operation on DBB and POB are given, the machine can also work as a simpliefied 3D bender. Upon material, work sizes and bending R being informed, the best suited model is proposed. What kinds of work specifications have ever been established with the Opton Hydroforming machine? What is the established case of Serpentine Benders supplied by Opton to the markets? Opton supplies Serpentine Bender under the name of plain bender and many have been supplied to the markets of ice machine, car air-conditioner, refrigerator etc where the machine is used for plain bending of flat/round pipes. There is a thin longitudinal line appears on top or bottom of a post-bent work piece. The press-die is not positioned in proper horizontal alignment to the bending roll. Adjust the vertical position of the press-die holder by turning its position adjuster screw. Is there any way to check if bending can be processed all through without interference? Please contact Opton sales advising work specs and the type of machine and serial number applied. Opton will return the reply after completion of Machine capacity check and simulation check . Is there any way good to make bending for a part with short distance between bend but at large bending R? It is suggested Opton to received a part drawing for numerical checking of relevant points. As an reference at moment, Multibender, G-WIN Robot Bender and/or Multi-stack R-vise + Multi (for Large R) Bender version of ECO Bender may possibly work for this. What is the minimum straight distance between two bending points? The figure depends on the diameter and thickness of a work piece with standard distance needed are 1.5 ～ 2.0 of material diameter. Even "0" distance may be accepted with mounting of Special designed tool. Any good machine to make a coiled part? Pipe Bender , Multi pipe Bender can do. Is there any good way to improve flatness of parts with small bending R? For the parts with smaller bending R than 1.5D of work, recommendation is the Opton's "UD "of 1D bender. For flatness improvement, mandrel is the most popular counter measurement. Booster power may also be given at keeping adjusted depending on the ongoing DOB motion. Practical information may be returned if Opton is advised on material, sizes, bending R and DOB figures, and precise comment may be returned if part drawing being supplied. Is there any way good for improving flatness of part without using mandrel? There are two possible ways, or bending with drawing die and DBB motion being boosted from rear. What is the time needed for bending? Standard average is 2～3sec./bend with varied time likely depending on machine model, work specification and machining conditions.